Looking for the Perfect Banner for Your Child's Birthday? If you have a child's birthday coming up and have been looking for the perfect banner for it, I would definitely head over to Etsy and check out Tecweb1Banners. 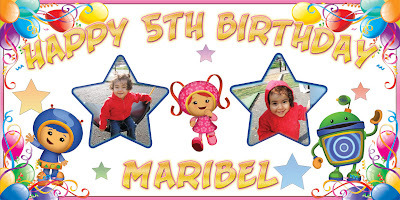 They create custom, personalized birthday banners that your child and guests will surely love! Banners come standard in a 3ft by 1.8ft size, but you can upgrade any banner to a larger size for an additional fee. You can also include a personal photo in a banner for an extra special touch. There are many familiar and favorite themes to choose from, including Sesame Street, Batman, Dora, and Disney characters. If you need a more general design for say, an older child, there are several of those as well. Since the banners are customizable, they are perfect for other parties and events such as graduation. NOTE: If you're looking for a specific design and don't see it, don't worry! Send them a note with what you are looking for and they can create a custom order for you. I love supporting small-shop owners whenever possible, especially when purchasing products like this. You get the same professional quality, with a very personal touch. Not to mention, you can save some big bucks! Click here to visit Tecweb1Banners and take a look around!